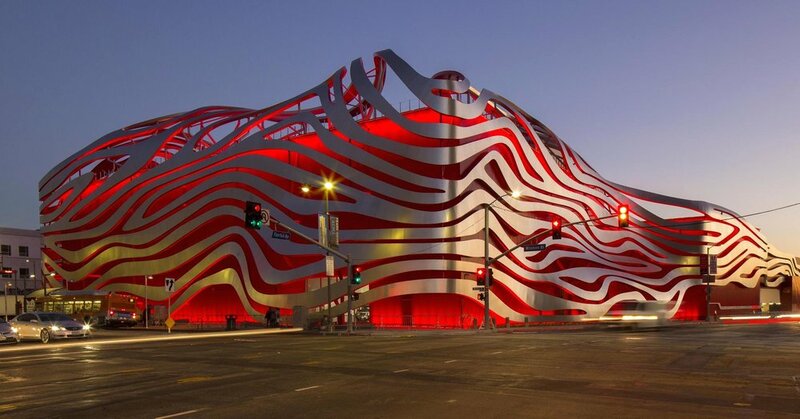 “Everyone has a story about a car,” said Adam Langsbard, Chief Marketing Officer of Petersen Automotive Museum. If you take a moment to think about it, really think about it, it’s true. Whether it’s the car your dad bought your mom as a surprise gift, or it’s the car you watched in the opening credits of your favorite show, or it’s the one that you always dreamed about for when you grew up - everyone truly has a story about a car. Allowing for that to be true, every car probably has a dozen stories of the life it’s lived, and that’s never been more evident than at Petersen. Whether your a car enthusiast or really have minimal interest in the automotive world, this museum will knock your Ferrari-branded socks off. The home of hundreds of iconic, rare, and downright unbelievable cars each with stories attached to them, simply of how many of them found their way to the unusually, eye-catching building are well-worth the small fee of admission. Today, the yellow remake of a classic Dusenberg, called a “Dusi 2,”sits under lights, alongside the only remaining original, fully-restored DeLorean from Back to the Future, an enormous Batmobile from the 80s, and many more. The museum is more than cars, parked, with explanatory signage next to them. But it is that, too. “When I closed the museum [for renovation], we had 7 flat screens. When I reopened I had over 100 projection units, tablets, and touch screens,” said Langsbard, highlighting the amount of content the museum now has to offer, aside from the physical cars themselves. State-of-the-art display and projection technology from their partnership with Panasonic, racing simulators co-designed with Microsoft, to augmented reality from Pixar, the Petersen team went above and beyond to make this automotive experience one for more than just horsepower-loving men, it’s an environment with something nearly everyone. They’ve managed to do the delicate dance of expanding their audience beyond their core base of regulars - which was more male, a bit older and whiter - while simultaneously offering their base something that is without rival. Most people haven’t stood next to a multi-million dollar car, but you’ll spend time beside many in the few hours you’ll take moving through the Petersen. The full family experience happens on the second of three floors of cars. Walking around with iPads, younger patrons drive through the process of building their own car, with help from characters from Pixar’s enormously popular film, Cars. The voices of the stars of the film guide them through the fine details and raw materials of crafting one of the most beautiful brands, Maserati. Then it’s a trip through the many ways cars have been powered from the turn of the 20th century to today (and perspective on tomorrow). The Precious Metals exhibit features rare cars, all in silver hues, to highlight the timeless artistry of car-making. The Keith Haring exhibit demonstrates cars - and one motorcycle - as canvases for one-of-a-kind art. According to the Petersen, their display is the first time all of Haring’s work on motor vehicles can be seen together in the same room. The Petersen still has that new car smell, but it’s already changing. New exhibits have already come and gone, and more are on their way. This April they’ll welcome Seeing Red: 70 Years of Ferrari, an exhibit celebrating seven decades of one of the most iconic automobile brands in history. This year they opened a new 180-degree exhibit featuring the history and works of racing maven Dan Gurney. Filled with more than cars, but a short film and Gurney’s customized engines are on display for race fans to enjoy. Voted among the top offerings in the world for, Langsbard believes Petersen is set apart because of what they’ve been able to accomplish and where they’re already planning on going. He thinks they’re special because they aren’t specialized. You’d be hard-pressed to visit Petersen and only notice the cars. Re-opened just over a year ago, the facility - that was once “an old department store with cars parked in it” - came back to show off it’s cars but also it’s custom content, and rather unusual new façade. that has changed the face of Wilshire Blvd and Fairfax Ave. You’d have to be blindfolded while asleep to miss the red building with ‘ribbons’ that rise up five stories in the air. Langsbard says the architect, Kohn Pedersen Fox Associates of New York, wanted the new museum to look like it was moving to those that passed it. They wanted a stark contrast to the square department store they’d been housed in since 1992. It cost a modest $90-million to redesign the building inside and out and love it or hate it, the renovation makes a bold statement to casual passersby and is certain to be the standout among the many museums coming to this part of town in the coming years. NBC News: OpEd: Dear Bill Maher, You Dropped the N-Word. I'm Breaking Up With You.